New Delhi (Sputnik) — It will be Maersk's first container movement in the 1390-km inland waterway in the River Ganga from Haldia to Varanasi, which the Indian government has been developing with technical and financial assistance from the World Bank at an estimated cost of around $790 million. The project would enable commercial navigation of vessels with a capacity of 1500-2,000 DWT. "With Maersk on board, the cargo from the hinterland will move directly to and from Bangladesh and rest of the world through the Bay of Bengal," a press release by India's Ministry of Shipping reads. Listing out the benefit of the container cargo, the ministry said that it reduces handling costs, allows for easier modal shift, reduces pilferages and damage, and also enables cargo owners to reduce their carbon footprint. The Indian government has successfully completed at least 15 waterways, including integrated movements through the River Ganga, Indo-Bangladesh Protocol Route and National Waterway-2 in River Brahmaputra. Besides, feasibility studies are being undertaken by the Inland Waterways Authority of India (IWAI) for 106 new national waterways. As per the Detailed Project Reports completed so far, 30 national waterways have been found to be technically viable. The government aims to increase cargo transportation through inland waterways terminal on national waterways in the country from the present 55 million tonnes to 150 million tonnes by 2023. The Inland Waterways Authority of India expects at least 1200-2400 tonne vessels to be required to meet the target by 2023. The Indian government, through the World Bank procurement process, has already engaged DST Germany to design ships for the River Ganga. 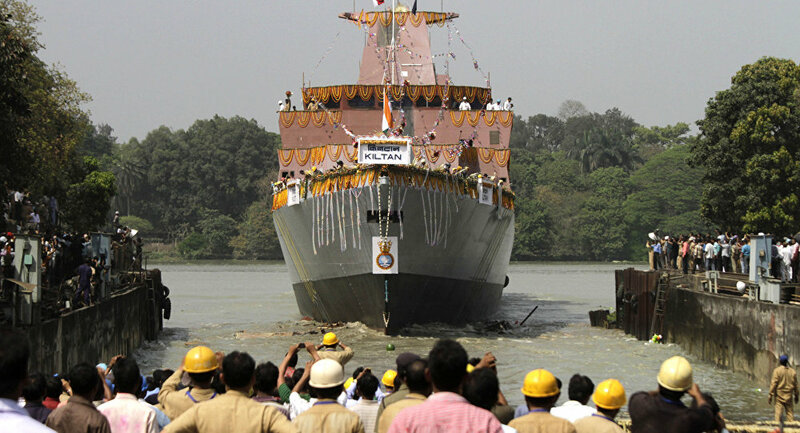 DST Germany has come up with 13 classes of ships, ideally suited for the River Ganga, which includes bulk cargo ships, barge, container ships and car carriers. Last year, Sputnik reported that India invited Russian firms to build marine vessels to augment the demand created by inland waterways. India is also exploring the possibility of utilising alternative fuel in water transport for which it is expected to seek Russian cooperation.